During the quarter we have seen many criticisms of American treatment of Native Americans in national parks. Soldiers removed the original peoples of Yosemite, and they trivialized the “Glacier Park Indians” (really Flatfeet) in Montana. The system honored ancient Indian cultures, as in the creation of Mesa Verde National Park, but did less with enduring cultures. More recently our parks have begun integrating Native Americans and their histories in our parks: Yosemite now includes a museum of the valley’s Indian past, and at least one national park is led by a Native American superintendent. 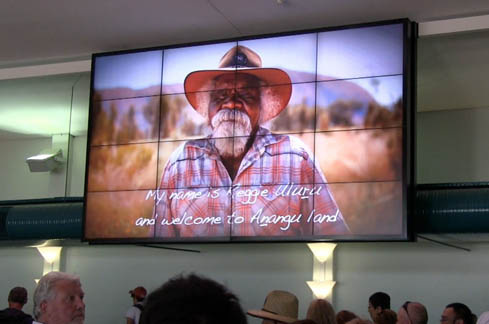 What can we learn from Australia’s approach to including the stories of its indigenous peoples? During the past week here, I have seen many examples of Aboriginal culture in a wide variety of presentations. I was aware immediately that we were approaching a different kind of park. The luggage conveyer looked like those in any other airport in the world, and the tourists showed the same eager anticipation in being reunited with their bags. But on the wall, we were welcomed by a simple film, the like of which I never saw I began my visit to region. 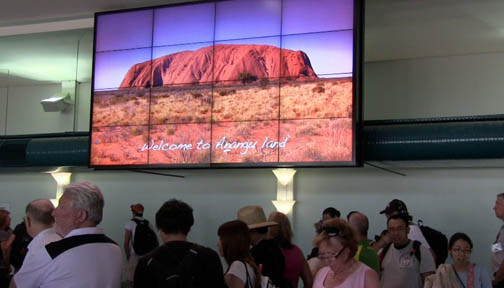 The image of Uluru, possibly the most famous rock in the world, was predictable, but the inscription underneath was not. I thought that this was a good beginning to creating a different approach to a National Park. 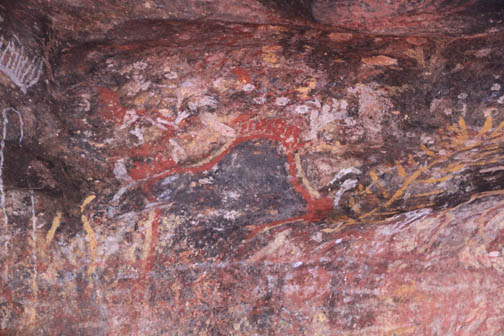 Now, what follows is a series of observations about the park, focusing on aspects of the Aboriginal story here. 2. Administration: The Australian government claimed the region, but in 1985 the government returned ownership to the local Aborigines with the requirement that they lease it back to the government to be administered jointly by the Indigenous people and the National Parks. 3. Tourist Accomodations: Visitors did not arrive in the area in great numbers until the 1950s. For a time there were accommodations in the park – a camp ground and a motel. But those have now been moved outside the park boundaries. At dark the park is completely closed to tourists in the interest of allowing the wildlife, who are mainly nocturnal, to roam without interference. The motels near the park can house several thousand tourists. Last night at dinner a waitress explained to me that our particular lodging complex can house several thousand visitors and employs about 500 staffers. Of these about 50 currently are Aborigines, and the park goal is to increase that number to 30 percent of all employees. I asked whether any of the Aborigine employees can speak a native tongue, and she reckoned that they all can. 4. Cultural Center: The cultural center tells the story of the rock and the Aboriginal relationship to the rock and features traditional stories of how different facets of Uluru came into being. 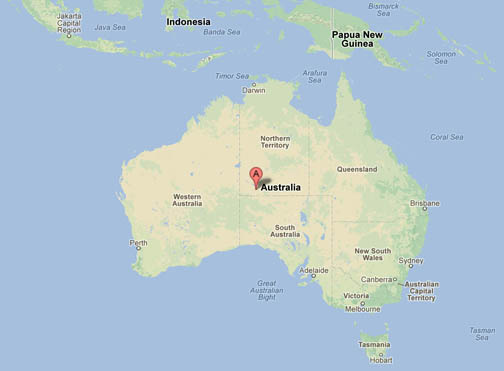 The center is built in the shape of two snakes reflecting characters in an Aboriginal tale about Uluru. 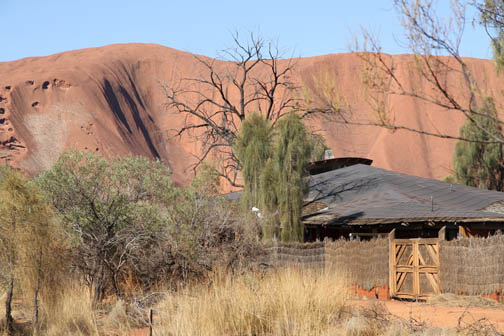 We were not allowed to take pictures inside the center, but this picture from outside with Uluru in the background illustrates how its architecture blends in with the land. 6. Traditional Values and Modern Tourism: In History 498 we have often discussed dilemmas in park history and management: how do you encourage tourism without the tourists overwelming the park; how do you provide access without carving up the wilderness with ugly roads. At Uluru I am struck by a remarkable bifurcation of a message about climbing the rock. -- On page 14 of the Visitor Guide we are told “Please don’t climb Uluru.” “What visitors call ‘the climb’ is of great spiritual significance to us. 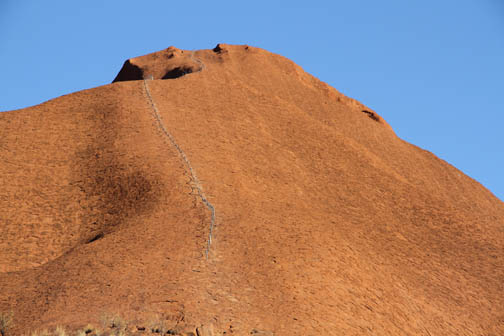 As a guest on Anangu land, we hope that you will choose to respect our law and culture by not climbing.” The message is repeated in this passage: “That’s a really important sacred thing… You shouldn’t climb. It’s not the real thing about this place. The real thing is listening to everything.” OK, understood.